Lode Runner is a 1983 platform game, first published by Brøderbund. It is one of the first games to include a level editor, a feature that allows players to create their own levels for the game. This feature bolstered the game's popularity, as magazines such as Computer Gaming World held contests to see who could build the best level. The prototype of what later became Lode Runner was a game developed by Douglas E. Smith of Renton, Washington, who at the time was an architecture student at the University of Washington. This prototype, called Kong, was written for a Prime Computer 550 minicomputer, limited to one building on the UW campus. Shortly thereafter, Kong was ported to VAX minicomputers, as there were more terminals available on campus. The game was programmed in Fortran and used ASCII character graphics. When Kong was ported to the VAX, some Pascal sections were mixed into the original Fortran code. In a weekend (circa September 1982), Smith was able to build a crude, playable version in 6502 assembly language on an Apple II and renamed the game Miner. Through the end of the year, Smith refined that version, which was black-and-white with no joystick support. He submitted a rough version to Brøderbund around October 1982, and received a one-line rejection letter in response, to the effect of "Sorry, your game doesn't fit into our product line; please feel free to submit future products." Smith then borrowed money to purchase a color monitor and joystick, and continued to improve the game. 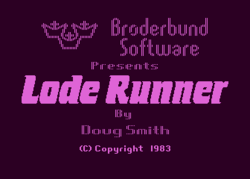 Around Christmas of 1982, he submitted the game, now renamed Lode Runner, to publishers and quickly received offers from all four: Sierra Online, Sirius, Synergistic Software, and Brøderbund. He took the deal with Brøderbund. The game was released in mid-1983. The original microcomputer versions included the Apple II series, the Atari 8-bit family, the Commodore 64, and a version licensed for the MSX computer. Later versions include those for the Atari ST, Sinclair ZX Spectrum, NES, Windows 3.1, Macintosh, and the original Game Boy. The player controls a stick figure, who must collect all the gold in a level while avoiding guards who try to catch the player. After collecting all the gold, the player must travel to the top of the screen to reach the next level. There are 150 levels in the first game which progressively challenge players' problem-solving abilities or reaction times. Levels feature a multi-story, brick platform motif, with ladders and suspended hand-to-hand bars that offer multiple ways to travel throughout. The player can dig holes into floors to temporarily trap guards and may safely walk atop trapped guards. Over time, floors dug into will regenerate, filling in these holes. A trapped guard who cannot escape a hole before it fills, is consumed, immediately respawning in a random location at the top of the level. Floors may also contain trapdoors, through which the player and guards will fall, and bedrock, through which the player cannot dig. Notably, the player can only dig a hole to the sides, and not directly underneath himself. This poses an important strategy: when digging through a wall that's n blocks high, the player must first dig a gap that's at least n wide to be able to dig through it, as the number of spaces will shrink with one each layer, and the player needs at least one free adjacent space to be able to dig. Pages in category "Lode Runner"
This page was last edited on 12 October 2016, at 17:04.